Guys…I have just discovered the COOLEST program! It’s called Book of the Month Club. I am all signed up and cannot wait to get the list of my book choices for November. On the 1st of every month, Book of the Month announces their picks for the month. By the 6th of that month, you either tell them which book you want or you skip the months selection. On the 7th of the month, they ship your book to you for free! Along with it comes a cute note and possibly some surprise goodies. Start reading, then join the online discussion for your book discussion. Since I love you all so much, I got you an offer code! Check it out below. 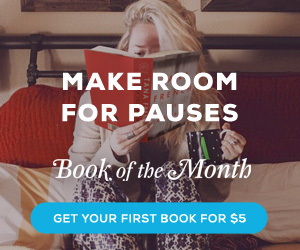 Click here and use coupon code BOTM5 for $5 for your first month! Leave me a comment if you sign up! I would love to hear your choice for the month. Bummer!! I will definitely keep you posted if any coupons for current subscribers come up. What book did you pick for December? I am anxiously awaiting the January list.